Catalog "VLM Corrosion Range 2017"
What do you need for your test? Over the past decade VLM has become the undisputed technology leader in the corrrosion testing technology with several patents granted and pending in this filed. As a result the company currently offers the widest product range of corrosion test chambers with a variety of form factors and volumes up to impressive 3500 L. The innovative design of VLM test chambers caters for unprecedented accuracy and reproducibility of test atmospheres. Another direction of own product development resulted in a wide range of metal block thermostat for the accurate temperature control (up to 600°C) of test samples in various laboratory environments. Our program of metal block thermostats is complemented by a full range of evaporators for concentrating laboratory samples. Beside standard products the VLM's particular strength is in creating tailor made solutions. Our primary role is to provide our customers with the best technology for the atmospheric corrosion testing, laboratory sample tempering and sample concentration - with VLM products you can fully rely on your test results. In the continuous process of product development we are always open to constructive criticism, suggestions and requests. VLM passed the certification audit. We provide the certificate under "certificates" . In contrary to the previous VDA test standard (VDA 621-415) the new ISO 11997-1 in its cycle B states that in the aeration phase the specimens must be dried within 45 minutes. In the latest version of this new test standard published in November the drying time was extended to 75 minutes. VLM test chambers for cyclic climate tests meet this requirement because they are equipped with powerful aeration fans whose speed is automatically regulated in order to enable a constant air flow. 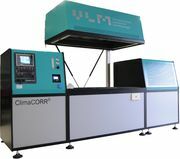 VLM's CCT and ClimaCORR test chambers use environmental air that in some cases should be conditioned by means of a climate module according to the ISO 11997-1 Cycle B requirements (23°C±2°C and 50% RH±20%). VLM technology - always one step ahead. A good example of a rapid implementation of customer's idea: the light tower with. What is the concentration of chloride ions in the test solution and in the fall-out? Titration instead of refractometric, the chemical alternative for frequent measuring.